One of my favorite discoveries over the holidays was Google Currents, which delivers beautiful magazine-like editions of many of your favorite content provides to your tablet and smartphone. I use it to read a Forbes, Fast Company, cnet, Edgadget, TechCrunch, Adnroid Central, Entrepreneur, Lifehacker and Men’s Health (among others). It’s available for iOS and Android devices and it is of my new "go-to" programs. 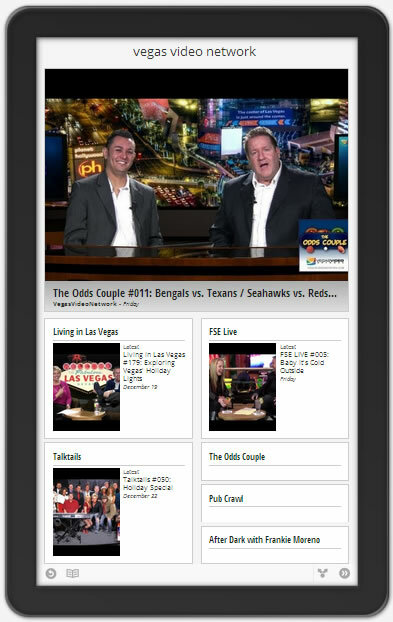 While using it, I wondered what it would take to be able to view VEGAS VIDEO NETWORK content within Google Currents. After some investigating, I found out it could be done. And. . .
. . .IT HAS BEEN DONE. As we are a new content provider, you won’t be able to find us in their catalog until we hit a certain number of subscribers (which isn’t clearly defined). But if a couple hundred of you do subscribe, we will hit their first hurdle; surfacing in their search results.